Bob Moyer takes a slight diversion into history and an entertaining novel based on the true story of a woman crime fighter. 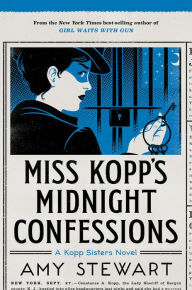 MISS KOPP’S MIDNIGHT CONFESSIONS. By Amy Stewart. Houghton Mifflin Harcourt. 384 pages. $26. Don’t judge this book by its cover. Although the titillating title suggests some salacious material inside, there is none, nor is there much crime involved. Instead, between the covers of this third book in the series is a carefully crafted historical novel, based on the true story of the Kopp sisters circa 1916. Constance, the star of the series, was the first deputy sheriff in America. Newspapers and tabloids across America trumpeted her adventures at the time. Her sisters play supporting roles: Norma as the curmudgeonly caretaker of the household, Fleurette as the fledgling starlet flirting with a life behind the footlights. Those are the archived bones of the Kopp sisters upon which author Amy Stewart hangs her fictional narrative. As matron of the Hackensack jail, Constance comes up daily against the male-dominated system, in the time before women even had the vote. Her daily struggles are an implicit part of the storyline here. On a larger scale, the author uses the deputy’s occupation to highlight the plight of young women brought into the jail on charges of waywardness and moral depravity, charges that can be brought simply because a family reports that a girl under the age of 21 left home, or may be cohabiting, with no charges leveled against the man. Stewart imports two fact-based characters to carry this theme through the novel: Edna, the innocent 18-year-old who leaves home to take a job in a munitions factory, and Minnie, the not-so-innocent 16-year-old caught in a sham marriage. Constance struggles to save them from imprisonment until the age of 21, and from the label of moral depravity that a conviction would stick them with. At the same time, Constance must struggle with the flight of Fleurette into a theatrical touring company. The same age as Edna and Millie, making the same claim on her freedom, Fleurette presents a dilemma for Constance — can she be as committed to her sister’s freedom and rights as she is to those of her charges? Fleurette’s fancy of a life onstage, seen here in the harsh light of theatrical touring, provides Stewart even more opportunity to infuse historical detail, including lyrics of long-lost tunes from the times. Indeed, the fictions foisted upon the facts here are themselves quite harmonious reading. The Kopp Sisters’ saga rests light on the page and the reader, speeding right along. Author Stewart does not let history weigh either her narrative or her reader down. This entry was posted in Historical Fiction, Popular fiction and tagged Constance Kopp, female crimefighter, female deputy, Historical fiction. Bookmark the permalink. Sons and mothers and Jackie O. The Briar Patch flora and fauna.